The simplest way to open and access blocked websites on Android Smartphones is using the best free VPN app like Turbo VP. The internet is the place where we can search for our problem solutions and information to get the benefits of technology to dilute human ignorance. But many times governments restrict or ban some websites for the particular geographical region due to political issues, infringement laws or content type. To fulfil the increasing demand for smartphones, the Android phones are already in the market, those used by most of the people for internet searches. So, when it comes to Desktop PC you can easily access the blocked websites by using some free VPN software available in the market. But what about the Android smartphone which is in your pocket and most of the time you used it for all internet related tasks? 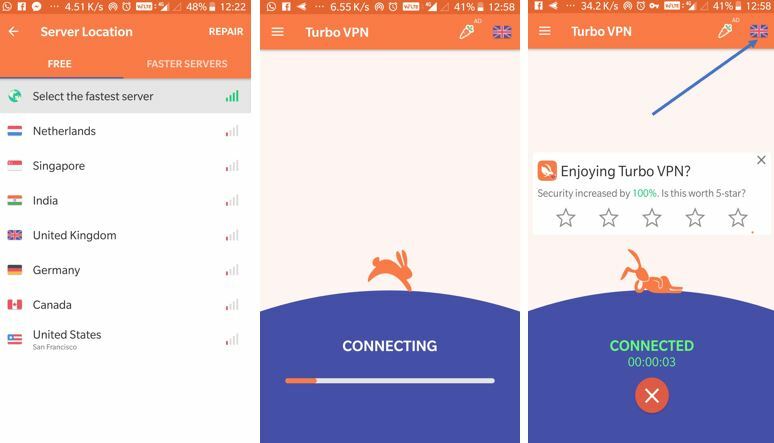 Thus, if you think some sites are not opening on your android phone, then today we are here with a free VPN app called turbo VPN that allow opening blocked sites in all Android phones. It is a simple app that provides access to both premium and free VPN servers to unlocked the websites those are blocked by the ISP (internet service providers) in the user’s vicinity. It works on all networks whether it is WiFi, LTE, 3G, and all mobile data carriers. For example: If you are in India then there are lots of websites those blocked by the telecom carriers, for example, JIO; you can use the Turbo VPN free VPN servers to unlock them and in case you like the service and require fast servers then premium VPN servers are there too. To unblock the blocked websites on an Android phone or tablet you can use best free VPN apps such as Turbo VPN – Unlimited Free VPN, Orbot – Proxy with Tor, Hola Free VPN, and IFast VPN. You can use any of them to access blocked websites but personally, I recommend the Turbo VP, at least for me it works great. Go to Google Play store and search for Turbo VPN. After installation just opens this free Android VPN app. If you want the Turbo VPN to connect automatically when it starts. Then tap on the burger icon given on the left side of the Turbo VPN app when it starts. Now from the menu select the settings option under which turn on the “Connect when Turbo VPN starts” option by sliding toggle button. Now the app offer both paid and free VPN servers. To select the free server tap on the globe icon given on the right top side of the screen. 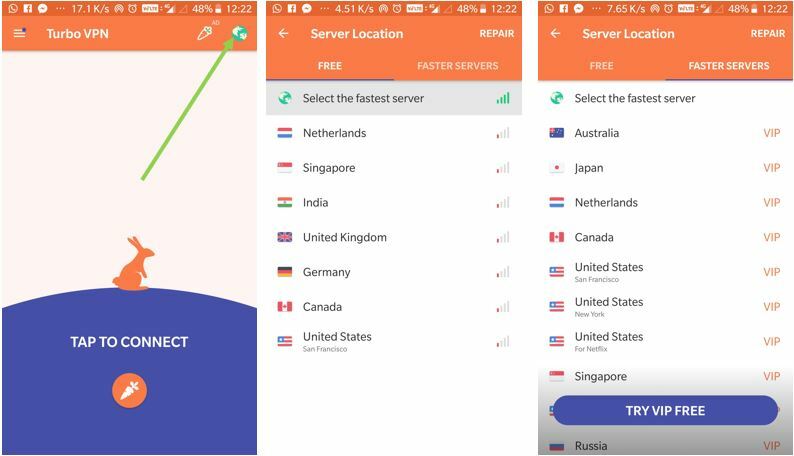 You will get a list of the Turbo VP app’s free VPN servers from different regions such as Nthe etherlands, Singapore, India, United Kingdom, Germany, Canada and the United States. Select any of them. Here, while writing the article we were using the VPN server from the United Kingdom. If you think app really works for you then you can also go for the VIP servers for high-speed connectivity. Tap on the server you want to connect and the Turbo VP app will automatically connect it to the respective server in few seconds. After connecting its time to test whether the VPN server is working or not. 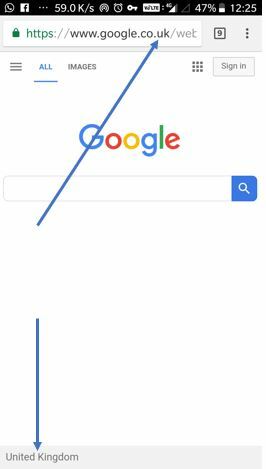 So, we opened the Google Chrome and search for the Google. By default, the Google always opened its search engine according to the country. For example, if you are in Indian it will be Google.co.in, for Russia– Google.ru and in the same way; If I am using the Turbo VP, virtually I should be in United Kingdon then my Google search engine domain will be Google.co.uk. And the same you can see in the given screenshot. While using this free VPN app, we also able to unblock many movies website those are blocked in my country. For example megashare. Also, the speed of Turbo VP VPN servers are pretty much good expect peak timings like evening.